Lots of towns near Dallas have low crime, affordable homes, and good jobs; McKinney is no exception. What makes it stand out is its gem of a downtown. Lovingly restored 19th-century buildings house restaurants, boutiques, and galleries; the 1875 courthouse contains a new performing-arts center. 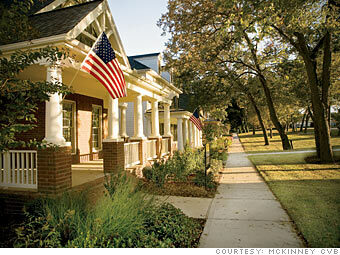 McKinney's employment opportunities are robust, sparing many residents a rush-hour drive of up to an hour to Dallas. Defense contractor Raytheon has a 3,700-person division here, and a mix of businesses in financial services, medical technology, and eco-friendly manufacturing are moving in. Is McKinney a great town, or what?